As you can probably guess, this was the outfit that I wore out to lunch with L this afternoon. I've worn my hair down a lot this week so I decided to mix it up a little bit and put it in a messy low bun. I think I have probably between 6-8 hairties in my hair in these photos... my hair seriously never wants to stay put! It takes practically a whole package of hair elastics for it to stay in one place. :-) I also decided to mix up my make-up a little bit today. There isn't a close picture of my eye make-up here, but I'm trying out masacara on my bottom lashes. Usually I just wear it on top but for Christmas I got some masacara specifically designed for the bottom lashes, so I wanted to experiment with it. Not sure if I like the look or not, but it could appear again soon! 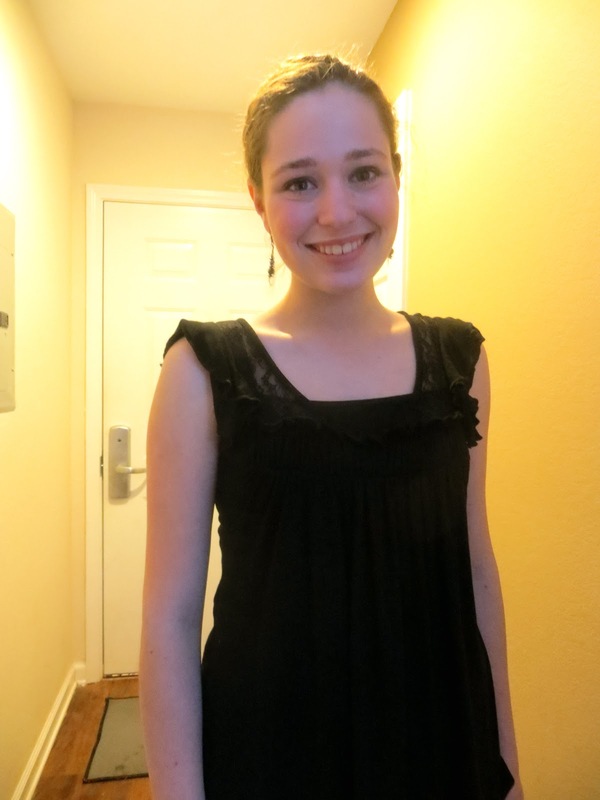 This adorable black top that I'm wearing was a gift from my friend K's mom. K is one of my best friends in college (Her 19th birthday was actually yesterday!) and I had gone to stay at her house for Thanksgiving instead of going home to Maine. K's mom had bought this top for her a few months before at either Marshall's or TJ Maxx, but it didn't fit K very well so it was passed onto me. :-) I love the ruffles in the sleeves and the touch of lace! I'm also wearing a black tank top under it to keep it modest. The tank top is from Wet Seal. My grey cardigan seen in the 3rd picture is something that I found on sale at Kohl's my junior year of high school. 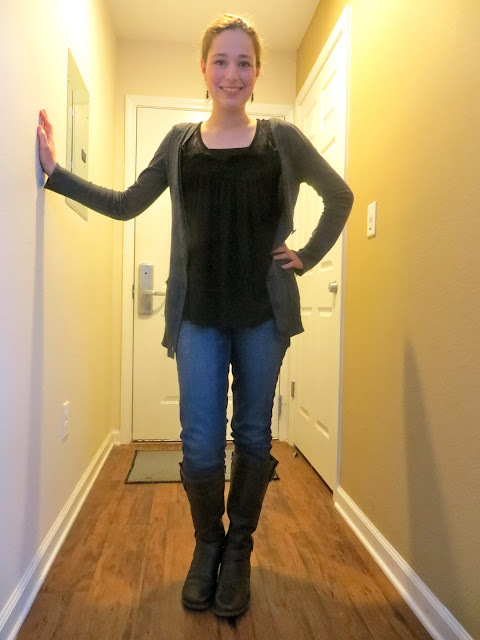 I love practical cardigans like this- I pair them with a lot of different things! I think that the dark grey of the cardigan and black in the top look very chic together. 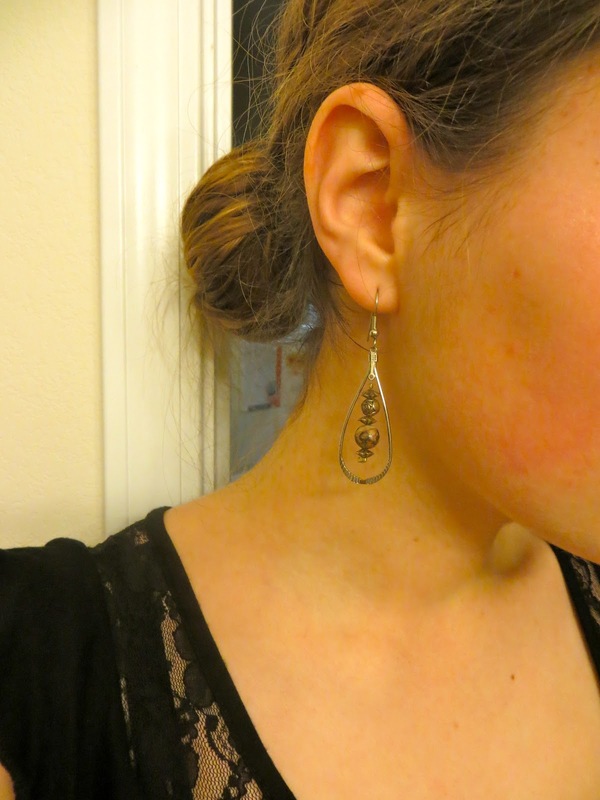 These earrings used to belong to my mom. Sadly she has some sort of issues with her ear piercings that they stay permanently infected so she can't wear earrings anymore. Luckily for me this means that I can have access to some of her old jewelry! :-) I'm not really sure where these earrings came from or when she got them, but I think they've very cute and the perfect touch to this winter afternoon outfit!